I try my best to pair food and wine. At the end of the day there are no set rules. If someone tells you there is, they are wrong. What matters “does the food and wine work with each other”? For example, salty foods will make your red wine more sour or astringent (dry mouth feel). Where a buttery or fatty meal will make the astringent Cabernet Sauvignon softer and silky. Tonight Chris was making Fajitas with some left over steak we had the night before. My task was to figure out what would match the spicy savory meal. In the past I have chosen a bottle of Zinfandel and tonight I would do the same. Deep color depth and a dark purple hue. The Reserve Zinfandel was very aromatic. It smelled young-fruity and sweet. I could smell spice and blackberry fruit. 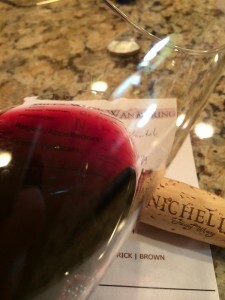 The Reserve Zinfandel was dry and full-bodied. The acidity was nice. The tannins were medium with a slightly dry mouth feel. The Zinfandel was flavorful. Tasting the wine it was overly sweet and had a silky finish. abv: 16.1% – Wow this one is high. The higher alcohol gave the wine the sweeter taste. 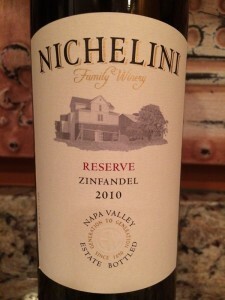 I rated the 2010 Nichelini Reserve Zinfandel three glasses. I was bouncing between two or three because how sweet the Zinfandel tasted. 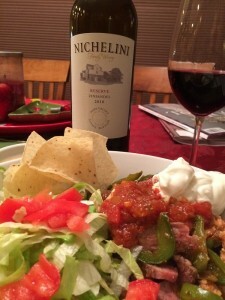 The Reserve Zinfandel did pair well with the spicy Fajitas we had for dinner, so that is why I gave it three glasses.